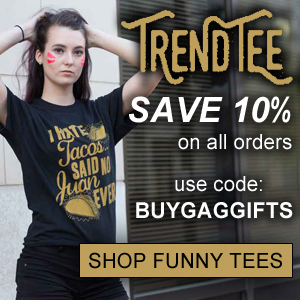 Welcome to BuyGagGifts.com, your source for Gag Gifts like the The Booty Shirt below. Check out our other gift categories for more gag gifts, novelty gifts and fun gifts. $10.19 when you use our exclusive coupon!! Ever get your Shirt caught on a fence or car door and end up with an unfortunate rip? Now you can be prepared for all embarrassing events by wearing the Booty Shirt! This Shirt has an artificial Bum print right on the back hem. It looks real but it's really just a clever screen print. A shredded piece hangs from the bottom and voila! you're an instant laughing stock. No one will even notice the ice cream you spilled on your collar, the dandruff on your shoulder or the small chihuahua you've abducted under your arm. This Shirt really pulls a fast one on everyone who thinks they've pulled a fast one on you. Let it all hang out!